Hey Pixlbit, how's it going? Today is the 5th anniversary of the Sonic All-star Racing series. For those who don't know, the Sonic All-star Racing series are arcade styled racing games with Sonic and Sega characters in it. It basically is like Mario Kart, since it has the courses, items, and characters and their vehicle. The only real difference is that it doesn't feel like a traditional kart racer, it's more arcade styled and faster. The first Sonic All-star Racing game came out in 2010 for all game systems, except maybe the PSP. I'm sure alot of people thought it was just a Mario Kart clone, but it's actually one of the better ones. My brother actually owns 3 versions of the game, one on the Wii, DS, and the PS3. Infact, my brother played the Wii version so much that the disc stopped working. As far as all the versions go, the only difference was that the DS version ran at a faster frame rate but looked bad, but the 360 version had Banjo and Kazooie sporting their Nuts and Bolts design as exclusive characters. Originally Mario was planned as an exclusive character for the Wii version but was scrapped because Mario was already in a crossover title with Sonic. The games themselves have more content than Mario Kart, like you have your traditional race modes, a battle mode, both local and online multiplayer, and event modes. It also has one thing Mario Kart doesn't, and that's characters from more franchises rather than focusing on one franchise. You have Sonic characters, you have characters from Virtua Fighter, Samba de Amigo, Crazi Taxi, Jet Set Radio and more. Each of them also have a special move called the All-star move that works kinda like character exclusive items from Double Dash. 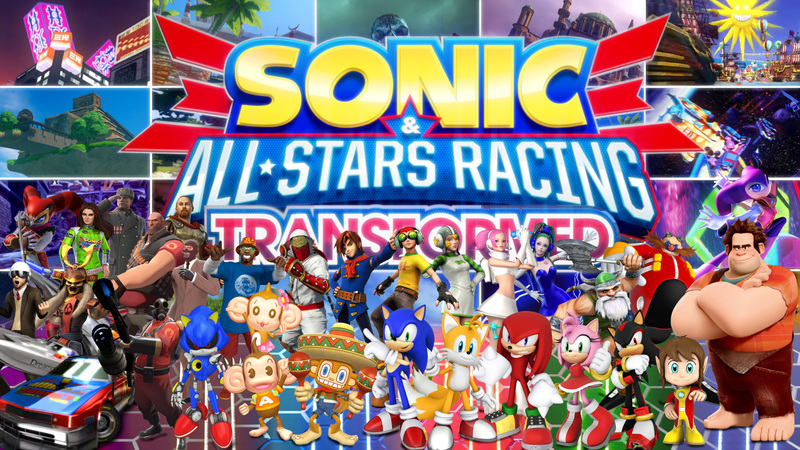 In 2012, Sumo Digital (the developers of the Sonic and Sega All-star series) released Sonic and All-star Racing Transformed, a sequel from the the previous racing game. This game is just packed with content. One of the biggest changes were transforming vehicles and tracks that change with every lap. The tracks themselves have road sections and sometimes the course has air and water segments to switch it up, sometimes all 3 and this is where transforming vehicles come in play. The vehicles have 3 different forms that are used for different terrain, like land, sea, and air. It also has much more variety in tracks now too. The game is also a big love letter to Sega fans, there are just alot of cameos and easter eggs throughout the whole game. It can be cameos or easter eggs in the tracks themselves and you really have to pay attention to find them. The character roster is good too, I'd say the original had more variety in it's roster but this one is good too. They also added Ralph from the Wreck-It Ralph movie and Danica Patrick from NASCAR for some odd reason but whatever. There were originally console exclusive characters planned but they couldn't get the rights to them or companies turned the offers down. Originally Master Chief or Banjo were going to be on the 360 but they turned the offer down. Sackboy was for the PS3 but Sony said no because Sackboy was in his own racing game and you can see how that turned out. And finally, Fox was going to be for the Wii U version and Kirby for the 3DS version. Fox didn't get the greenlight but Sumo actually had a working prototype of Kirby, but Nintendo told them not to put him in the game. However, the laser sound from Starfox can be heard in the games roulette wheel before you start the level if you listen closely. There's also a rumor that Mega Man was considered too but Capcom also declined the offer. The game is just a blast to play, it's great by itself but it's even better with more people. I would say the game surpasses Mario Kart, but I like both series because they are different in their own games but they are fun just the same. This is basically Smash Bros. for Sega fans and you can see all the care they put in the game. Sumo Digital is even in talks about the next game, but it would take something pretty big to top down transforming cars. So, did you ever play any of the Sonic All-star Racing games? Thanks for reading and later. Yeah the Sonic & SEGA racing games were great, and definitely were able to compete with Mario Kart on many levels. I like the character selection better in the first game, but the tracks were better in the second game. Can you guess who my favorite SEGA racers are? I love both of these games. Very well put together and nice to look at too. I never played these, but I have a feeling I'd actually prefer them to Mario Kart. They do look like very fun racers. I'll probably get Transformed for PC once it's on a very reasonable sale. I picked up Transformed last year. It's a good game.